Two California Chamber of Commerce-opposed job killer bills will be heard in the Senate Labor and Industrial Relations Committee today; one deals with releasing company pay data and the other with unlawful employment practices. Both bills are opposed by a large coalition of employer groups and local chambers of commerce. SB 1284 (Jackson; D-Santa Barbara) Disclosure of Company Pay Data. SB 1300 (Jackson; D-Santa Barbara) Removes Legal Standing and Prohibits Release of Claims. SB 1284 requires that in 2019, an employer that is incorporated in California with 100 or more employees must submit a pay data report to the Department of Industrial Relations (DIR). CalChamber has identified SB 1284 as a job killer because the bill creates a false impression of wage discrimination or unequal pay where none exists and therefore subjects employers to unfair public criticism, enforcement measures, and significant litigation costs to defend against meritless claims. Just last year, Governor Edmund G. Brown Jr. vetoed AB 1209 (Gonzalez Fletcher; D-San Diego), which was a very similar bill. SB 1284 provides the same uncertainty and ambiguity as AB 1209. As also referenced in Governor Brown’s AB 1209 veto message, there is a Pay Equity Task Force assigned to analyzing the Equal Pay Act, as well as workplace and compensation policies that can lead to successful compliance with the Act. Given that the task force is supposed to release its report this year, SB 1284 is premature and the Legislature should wait for the report before imposing a new mandate on employers. SB 1284 Exposes Employers to Public Shaming for Wage Disparities That Are Not Unlawful. SB 1284 requires employers to collect data regarding wage information for all employees with the same job title and submit that data to the DIR, with no parameters regarding how the information will be used and if the information will be publicized. CalChamber and the coalition are concerned this will lead to public shaming of employers because, while the aggregate data might disclose wage disparities, wage disparities do not automatically equate to wage discrimination or a violation of law. SB 1284 allows employers to use the federal Employer Information Report, otherwise known as the EEO-1 Report. However, EEO-1 reporting of pay data has been suspended under the current administration. Additionally, the EEO-1 is not identical to SB 1284. Thus, requiring California employers to comply with a new and completely separate mandate. SB 1284 Utilizes Data That May Be Affected by Employee Choices. SB 1284 requires employers to provide pay data regarding an employee’s total earnings as shown on the Internal Revenue Service Form W-2. However, a W-2 form does not take into account an employee’s own decisions and actions that can also create wage disparity that has nothing to do with discriminatory intent by the employer. SB 1300 removes the legal standing requirement for specific Fair Employment and Housing Act (FEHA) claims and limits the use of nondisparagement agreements and general releases. CalChamber has identified SB 1300 as a job killer because these provisions will significantly increase litigation against California employers and limit their ability to invest in their workforce. SB 1300 Removes the Standing Requirement and Allows Anyone to Sue a Company for Specific Harassment Claims. According to CalChamber’s analysis of SB 1300 this means that, a plaintiff who has not suffered from harassment or discrimination still can bring an action against the employer. SB 1300 also creates a new private right of action for failure to prevent harassment or discrimination.Thus, an individual who believes an employer did not do enough to prevent discrimination could pursue a claim against the employer seeking: compensatory damages, injunctive relief, declaratory relief, punitive damages, and attorney’s fees all without suffering an actual injury. SB 1300 Is Unnecessary and Exposes Employers to Costly Litigation. Sexual harassment prevention is already regulated by the Department of Fair Employment and Housing (DFEH). The California Code of Regulations provide explicit requirements for what is expected of employers regarding harassment, discrimination, and retaliation prevention. SB 1300 Will Deter Employers from Conducting Self-Audits and Providing Severance Agreements. The bill prohibits the use of a general release in exchange for a raise or bonus, or as a condition of employment or continued employment. However, the terms “raise” or “bonus” are not defined. It is unclear whether a severance payment would be considered a “bonus” and therefore prohibited. The prohibition on using a general release also is a disincentive for employers to take remedial action, such as wage and hour self-audits. Self-audits are extremely burdensome, time consuming and expensive. This is not a task employers take lightly and if an employer is not permitted to utilize a general release of claims in exchange for a “bonus” or “raise,” it may deter employers from conducting self-audits. SB 1300 Will Chill the Use of Settlement Agreements, Disadvantaging Employers and Employees Alike.SB 1300 prohibits nondisparagment agreements, which are part of virtually every settlement agreement. If the employer cannot guarantee that the employee will not disparage the employer after a settlement agreement has been made, the employer will not have the same motivation to settle a case. As the benefit of a settlement agreement for the employer is reduced, the less likely the employer is to settle claims out of court. Therefore, SB 1300 will chill the use of settlement agreements and will drive employers to fight these cases in court instead of utilizing early resolution. Both SB 1284 and SB 1300 will be heard in the Senate Labor and Industrial Relations Committee today. 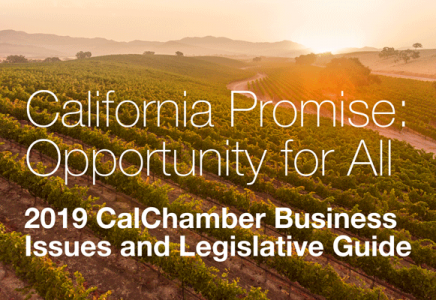 CalChamber is urging businesses to contact their senator and members of the committee and tell them to oppose SB 1284 and SB 1300 as job killers.